The Aludiba foundation, a foundation set up to support among other things the needy and vulnerable in society, is to carry out free medical screening in Bawku from Monday. The foundation believes that a healthy society is a precursor to a brighter future hence the initiative. 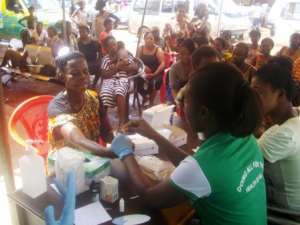 The screening exercise which will be conducted by professional medical personnel shall cover the areas of vitamin A supplement for children, Hepatitis B, cervical cancer screening and treatment, general surgeries, eye screening, oral health, sickle cell disease screening , diabetes screening and general examination of the well being of the people. The screening will take place at the following areas: Bawku Naba's Palace, Sabonzongo, Posuom, Natinga and the Central Mosque area of Bawku. Members of the communities are urged to come out in their numbers to access the medical screening exercise which will be free and will take place from the 15th to 17th April, 2019. Speaking to the Voiceless Media, Alhaji Abdul-Hanan Wahabu who is the CEO of Buffer Stock, explained that the Foundation decided to support this exercise to motivate and entice members of the Bawku area to check on their health status and equally take advantage of the free services on offer. It must be stated that the AlUDIBA FOUNDATION since its inception has supported the people in the areas of education, business development, agriculture , health and other humanitarian endeavours. The Voiceless Media will bring to our readers, details about the foundation and its operational areas and services later.